?A Shakespeare play is made to be performed. 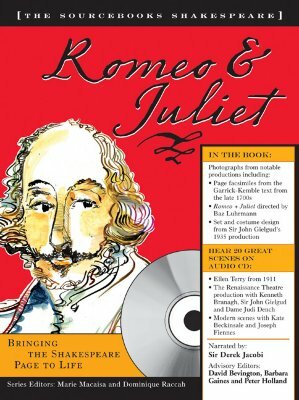 In The Sourcebooks Shakespeare, you will hear the play through multiple productions and conceive different faces of the play itself and its characters. Hearing important speeches performed in different ways is a remarkably easy way to understand and experience the play and may lead you to different conclusions about the play. The Sourcebooks Shakespeare is also a very visual text. We provide not only photographs from great performances but also costume designs and set renderings from different productions as well as production notes that take you inside the stage experience. These dramatic visuals and the audio make it much easier for you to read, understand and experience the play. Welcome to The Sourcebooks Shakespeare! David Bevington is the Phyllis Fay Horton Distinguished Service Professor in the Humanities at the University of Chicago. A renowned text scholar, he has edited several Shakespeare editions including the Bantam Shakespeare in individual paperback volumes, The Complete Works of Shakespeare, (Longman, 2003), and Troilus and Cressida (Arden, 1998). He teaches courses in Shakespeare, Renaissance Drama, and Medieval Drama. Shakespeare's Globe Theatre in London as well as on Northwestern University's Board of Trustees. Shakespeare plays, including A Midsummer Night's Dream for the Oxford Shakespeare series. He is also general editor of Shakespeare Survey and co-general editor (with Stanley Wells) of Oxford Shakespeare Topics. Professor Douglas Lanier Douglas Lanier is an Associate Professor of English at the University of New Hampshire. His publications include "Shakescorp Noir" in Shakespeare Quarterly 53.2 (Summer 2002) and "Nostalgia and Theatricality" in Shakespeare the Movie II (eds. Richard Burt and Lynda Boose, Routledge, 2003), and the book, Shakespeare and Modern Popular Culture (Oxford University Press, 2002). Professor Jill Levenson - Jill L. Levenson is a Professor of English at Trinity College at the University of Toronto. She has written and edited numerous essays and books including Romeo and Juliet for the Manchester University Press's series Shakespeare in Performance (1987), Shakespeare and the Twentieth Century (with Jonathan Bate and Dieter Mehl), and the Oxford edition of Romeo and Juliet (2000). Currently she is writing a book on Shakespeare and modern drama for Shakespeare Topics, a series published by Oxford University Press. Professor Lois Potter - Lois Potter is Ned B. Allen Professor of English at the University of Delaware. She has also taught in England, France, and Japan, attending and reviewing as many plays as possible. Her publications include the Arden edition of The Two Noble Kinsmen and Othello for the Manchester University Press's series Shakespeare in Performance. Ms. Janet Suzman Janet Suzman was trained at LAMDA and is an honorary associate artist of the Royal Shakespeare Company. Her work there has included The Wars of the Roses, As You Like It, The Taming of the Shrew, Much Ado About Nothing, Love's Labour's Lost, and The Merchant of Venice. She has been awarded numerous honorary degrees and was nominated for an Academy Award in 1971 for her performance in Nicholas and Alexandra. Her acclaimed 1990 direction of Othello in Johannesburg, South Africa is considered to be one of the most powerful productions of the play. Mr. Andrew Wade - Andrew Wade was Head of Voice for the Royal Shakespeare Company, 1990 - 2003 and Voice Assistant Director from 1987-1990. During this time he worked on 170 productions and with more than 80 directors. Along with Cicely Berry, Andrew recorded Working Shakespeare, the DVD series on Voice and Shakespeare, and he was the verse consultant for the movie Shakespeare In Love. In 2000, he won a Bronze Award from the New York International Radio Festival for the series Lifespan, which he co-directed and devised. He works widely teaching, lecturing and coaching throughout the world. Marie Macaisa is a lifelong fan of Shakespeare who has seen at least one theatrical production of nearly all his plays (she's waiting for Henry VIII). Her first career, lasting 20 years, was in high tech; she has a B.S. in Computer Science from MIT and a M.S. in Artificial Intelligence from the University of Pennsylvania. For the last two years, she has devoted herself to the Sourcebooks Shakespeare Experience. Dominique Raccah is founder, president and publisher of Sourcebooks. Born in Paris, France, she has a bachelor's degree in psychology and a master's in quantitative psychology from the University of Illinois. She also serves as series editor of Poetry Speaks and Poetry Speaks to Children.